Set in beautiful countryside in the heart of the Beskids mountain range, Krynica is the biggest mountain health resort in Poland. Often called the Pearl of Polish Spas, it is also a popular tourist and winter sports destination. It is situated 140 km from Krakow. 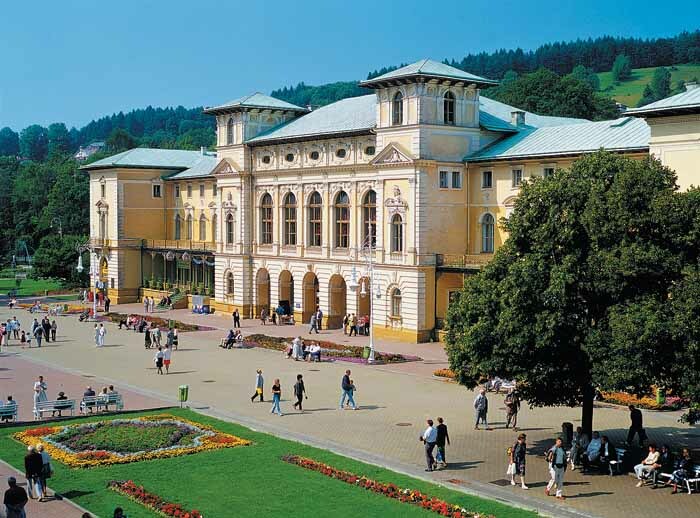 Krynica has been operating as a health resort for over 200 years.The healing properties of the local mineral springs had been known for many centuries, but the town started to expolit them only in the 19th century. Until the Second World War it was a fancy hang-out for artistic and intellectual elite. There are around 20 minerals springs. The most famous mineral water is Slotwinka. You can visit the pump rooms located on the walking promenade and throughout the city to taste and experience the medicinal properties of various mineral waters. Apart from all spa attractions, there are some places to see in Krynica. The Nikifor’s Museum, the best known Polish naive painter, offers a permanent exhibition of his works. In the basements of New Mineral Baths you can visit The Toys Museum ‘Bajka’. You can take a walk up the Parkowa Mountain where you will see the swans pond or love-spring called ‘Bocianowka’. On your way back you can take a ride by funicular. Not far from Krynica there is a village Kamianna, known as the Honey Capital of Poland. You can see there an open air Museum of Apiculture with a unique old apiary as well as taste and buy local honey specialties.